Its numbers that defined the story of the Indian art market in 2010. HS Razas Saurashtra sold at over Rs 16 crore at Christies 2010 summer auction and Arpita Singhs Wish Dream, which went under the hammer for a whopping Rs 9.6 crore at Saffronarts annual Winter Online Art Auction in December 2010, made headlines. And 2011 looks to begin on a positive note with the third edition of the India Art Summit (IAS) beginning in Delhi from January 21, drawing 84 galleries and 570 artists of both national and international acclaim. Having tread a cautious path to recovery in 2009, Indian art got back in the spotlight in 2010, both locally and globally. Increasing collaboration between Indian artists and international galleries and museums points towards the growing global confidence and recognition of Indian art and artists. The much-awaited Indian debut of internationally acclaimed artist Anish Kapoor materialised in November with a twin exhibition package at Mehboob Film Studios, Mumbai, and National Gallery of Modern Art, Delhi. The artist, whose work showcased in the 2009 edition of the IAS fetched a price of half a million pounds, is expected to draw visitors and moolah in the 2011 edition of IAS as well. Art experts are of the opinion that though the market is on a path to recovery after the slowdown due to the growing Indian economy and the global art market picking up, it's still a small group of key artists such as Souza, Raza, Tyeb Mehta, Gaitonde and Husain that find takers. 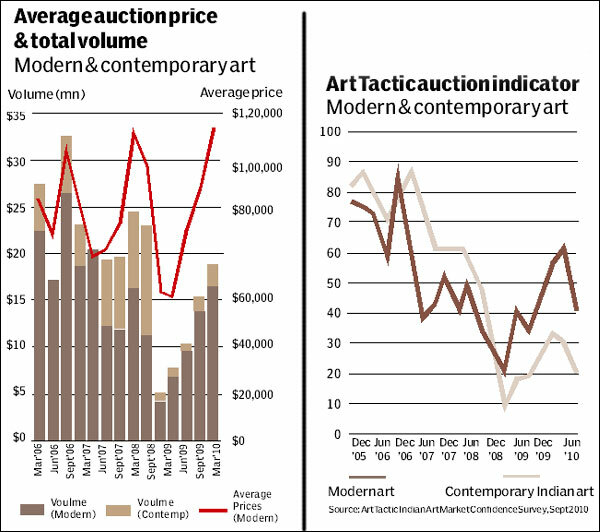 The trend is similar to what was observed in 2008, when the global economic meltdown took art down too, hitting the prices of Indian art by more than 40%. Anders Petterson, founder and managing director, ArtTactic Ltd (a London-based research house on the art market), believes that this trend will continue in 2011 as well. While the Indian auction market saw a slower growth rate in the second half of 2010, Petterson believes that if economic conditions remain favourable, the Indian art market will again pick up momentum in 2011, largely driven by the blue-chip modern Indian art market. Also, parts of the Indian contemporary market are likely to start to see a quicker recovery. And indications are that the momentum could increase in the first quarter of 2011, as results from ArtTactics latest Confidence Survey for the Indian art market in September 2010 show. The expectation indicator for the modern Indian market was standing 12% above the current indicator, says the survey. The survey also points out as to how the modern Indian art market staged a strong comeback in 2010, with total auction value increasing by 115% from 2009, and also exceeding the 2008 total by 16.2%. The contemporary Indian art market continues to tread water, and though total auction value has increased from $2.7 million in 2009 to $6.97 million during 2010, it is still 75% below what it achieved in 2008. At Christies, the annual auction totals for modern and contemporary Indian art increased from approximately $6,00,000 in 2000 to over $37 million at the close of 2010. Auctions featuring Indian art are now held up to six times a year in New York, London, Hong Kong and Dubai, making Indian gallerists optimistic of the art market getting back to its peak, albeit in a much more mature and cautious manner. Arun Vadehra of Delhi-based Vadehra Art Gallery calls the Indian art market a market of uniques and foresees a growth of 25-30 % in the auction market of Indian art in 2011. We have already gone beyond 2008 and with Indian art having a very small base of artists that are recognised globally, the market is bound to grow, says Vadehra. With optimism ruling the art market, Bhavna Kakar, director of Delhi-based art gallery Latitude 2, believes that artists from India are an integral part of the growing economy that is rising not just financially, but in creative spheres as well. This year will be even better since the performance in financial market spheres is exceptionally good and is predicted to continue. And the art market is a reflection of the financial economy of a country, says Kakar. Gallerists believe that after burning their hands during the slowdown, a more mature collector base has emerged. Collectors have realised the difference between good, better and the best! And they no longer look at the brand or the price tag, but for a change are looking at the works itself! adds Kakar. Despite a vibrant art culture in the country, the small scale of the collector base still remains a worry for the segment with tremendous potential. Neha Kirpal, director, India Art Summit, attributes the weak collector base to the lack of knowledge about art and the limited access and awareness that people have about art. There are hardly any public spaces that expose people to the wonders of art. With the kind of buying power available with the Indian collectors and the acquisitions they are making, it won't take long for the collector base to grow manifold, says Kirpal. With top-end modern artists making a strong comeback in 2010, Dinesh Vazirani, CEO and Co-Founder of Saffronart, sees a revival of interest in the contemporary art market. The market for contemporary artists hasnt recovered completely, but the coming year will see the market bouncing back, says Vazirani. A noticeable change in the collector base is the change in outlook. Collectors are acquiring works purely from a collection point of view and not solely with an investment purpose, he adds. Vazirani predicts the year ahead will see the birth of the institutional buyers. The ripples of the slowdown that still affect the segment is also a reason why 2010 saw a cautious approach towards art and exhibitions. Last year was a little conservative when it came to exhibitions and concepts, confirms Pooja Sood, chairperson and coordinator of KHOJ International Artists' Association. And for industry veterans, the market still remains in an indecisive phase. For Sunit Kumar of Delhi-based Kumar Art Gallery, it's difficult to describe the current state of the market. India is not contributing to even 1% of the global art market. We are still very young in terms of volumes and value, but there is hope of better times to come, says the veteran, who will be participating for the first time at the IAS. Kumar also believes that collectors, investors and the entire art fraternity are going through a reshuffle. Gallery owners, investors and buyers who were aggressive before the downturn have now become cautious and are taking stock of the current scenario, says Kumar. Despite a scenario of cautious optimism in the art market, there was no let up in art activities throughout the year, particularly in Delhi and Mumbai. While 2010 could be a year of retrospectives, starting from senior artist Krishen Khanna in January to veteran artist Ram Kumar in December, young artists have also found space. But Petterson adds that the international focus will be primarily on contemporary Indian artists with strong international gallery representation. Artists including Subodh Gupta, Bharti Kher (Hauser & Wirth Gallery), Jitish Kallat (Haunch of Venison gallery), NS Harsha (Victoria Miro Gallery) and Dayanita Singh (Frith Street Gallery) will be the flavour of the international market, says Petterson. While lack of public art is still a concern, it's opening of private institutions and foundations like the Kiran Nadar Museum of Art in Noida and the Devi Art Foundation in Gurgaon and events like the IAS that could prove to be the access point for a common man into the world of art. As Kirpal points out, IAS is a single-window access for a layman and for the gallery owners, both national and international, into the world of Indian art. And this is substantiated with the sales that were achieved in the 2009 edition of the IAS. Art worth Rs 26 crore was sold in the previous edition of IAS (2009), of which 40% was sold to first-time buyers, says Kirpal. The growth of the event is also evident from the fact that it has managed to attract participants, beginning from Delhi in the first edition to nine cities across India till the third edition. With a common platform to exhibit, the summit has been able to fuel a growth in the number of genuine buyers, collectors and international museum delegations. With 84 exhibiting galleries from 20 countries, its the tier-II towns as well that are waking up to the wonders of art. Not just visitors, but we also have folk and tribal art that will find space to be showcased at the summit, says Kirpal. The past year witnessed several innovative showcases of new media art, which has found a special space in the upcoming summit. Like Kakar bringing together artist grandmother-grandson duo Anupam Sud and Kartik Sood to exhibit their works at the Art Summit 2011, or the inclusion of eight art projects that represent the work of a diverse mix of Indian and international contemporary artists. New media was the flavour for the year gone by and also of the upcoming summit. It surely has the art world hooked with the use of digital art, computer graphics and animation, virtual art, interactive technologies and even more interactive styles like painting in front of a live audience and so on. And the year ahead promises more in terms of international acclaim and exposure, as May 2011 will see the opening of the largest exhibition of Indian contemporary culture in Europe at the Centre Pompidou in Paris. The Venice Biennale will host its first Indian pavilion in June 2011 curated by art critic and curator Ranjit Hoskote. The story of the Rs 2,000-crore Indian art market is starting on a bright note. * Speakers' Forum: catch celebrated sculptor Anish Kapoor as one of the speakers at the Speakers Forum, which brings together public talks and seminars featuring Anish Kapoor, Hans Ulrich Obrist (co-director of the Serpentine Gallery, London), Homi Bhabha (director of the Humanities Center, Harvard University), Sheena Wagstaff (chief curator, Tate Modern), Urs Stahel (director and curator of Fotomuseum, Winterthur) and Hou Honru (director of exhibitions and public programmes, San Francisco Art Institute). * A whole section dedicated to solo exhibitions by 11 galleries has been designed. * A new addition to the fair will be 8 art projects developed specifically for the India Art Summit and which represent the work of a diverse mix of Indian and international contemporary artists. * While Pragati Maidan will be the core venue of the summit, related art events will be spread across locations, including the National Gallery of Modern Art, Gurgaon-based Devi Art Foundation, Kiran Nader Museum in Noida, the British Council and the French Embassy. * Reaching out to virtual viewers in the digital space, one of the nine commissioned live art projects, 'Feed Station' by the Foundation for Contemporary Art, will feature blogs about the art summit by those who have seen the summit in the digital space, while artist Abhisekh Arya, the creator of the project, will invite bloggers at the fair to post their views on the dashboard. * The Khoj Marathon is a series of 20-minute, back-to-back public interviews with 25 leading intellectualsthinkers, social philosophers, political analysts and artistsby compelling authority in the art and intellectual world Hans Ulrich Obrist and stalwarts including Homai Vyarawalla, Subodh Gupta, Bharti Kher and Vandana Shiva, among others. * The expanded Sculpture Park will showcase works by some of India's most significant sculptors and the video lounge will present state-of-the-art works by the masters, including the Otolith Group.